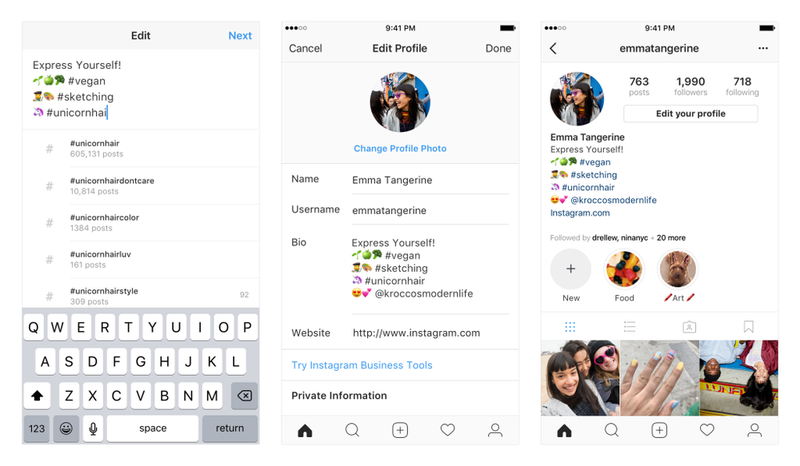 Instagram announced in a recent blog post that you can now put functional hashtags and links in user bios. This feature aims to increase discoverability for accounts. Now, when you put a @ or # in your bio, it will become a live link that leads to another profile or hashtag page. There’s a catch, though — when you mention someone else’s profile in your bio, that user receives a notification and has the option to remove the link. If this is the case, the profile will remain in your bio, but will not be live. This new feature is one of many in recent months. Instagram also added the ability to follow hashtags in December 2017. This feature was added with the intention of increasing discoverability for photos, videos, and people on Instagram. In addition to following hashtags and live hashtags and links in user bios, the photo-sharing platform began testing an official story “regram” feature in February and have continued doing so with a small percentage of users. Facebook says there are no official plans for a wide rollout right now, but it seems likely given the popularity of third-party apps offering the same functionality. How will this work? You’ll pick any public, permanent Instagram post and tap a button to embed it in your Story. As part of this process, you will be able to highlight or downplay the post’s original author, move and resize the image within your Story post, and add commentary or imagery using Instagram’s creative tools like any other story post. Viewers of the post will be able to tap on the embedded post to bring up a “see post” prompt to bring up the permanent feed post. Snapchat may have pioneered the Story, but Instagram is always tirelessly working to best their competitors.